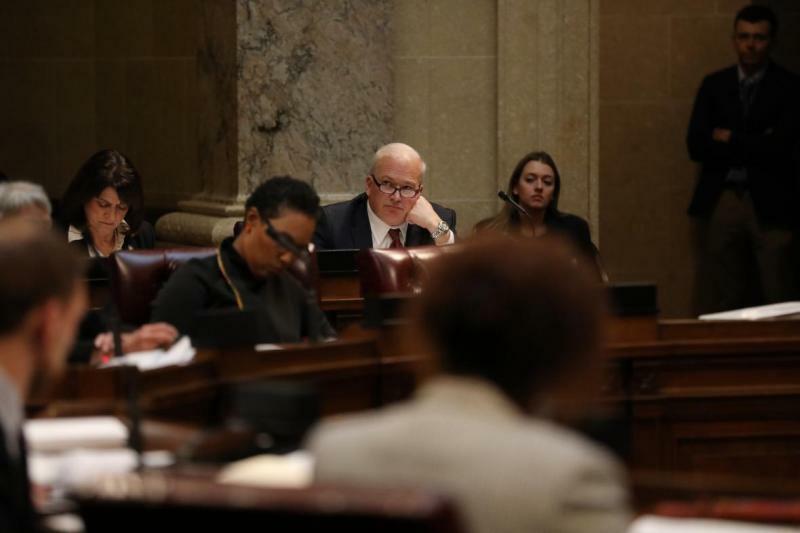 A set of bills rushed through the Legislature in a lame-duck session late Tuesday and early Wednesday morning will determine whether those on Medicaid have to work, and whether those with pre-existing conditions can get health insurance. A bill that aimed to offer protections at the state level failed to pass during the extraordinary session. Another avenue to protect those with pre-existing conditions is also in peril if Gov. Scott Walker signs the legislation. Wisconsin is currently involved in a federal lawsuit against the Affordable Care Act. If successful, the multi-state challenge against the ACA could eliminate protections for those with pre-existing conditions. On the campaign trail, Gov.-elect Tony Evers indicated that we could remove Wisconsin from that lawsuit. But under the newly approved bill, he would have to get approval to withdraw from the Legislature's budget committee, where Republicans hold a majority. In another newly approved bill, Evers would also have to seek legislative approval before modifying a federal Medicaid waiver that would affect childless adults under age 50 who make less than the federal poverty level — about $12,000 a year. Able-bodied, childless adults would have to pay monthly premiums. They would also have to work or do 80 hours of community service a month to get health benefits. Evers had said he was considering ending the policy sought by Walker, which was approved by the Trump administration shortly before the November election. Republicans in the Legislature said during floor debate that the changes would restore a balance of power between the legislative and executive branches. "The situation that we are sitting in right now if we do not pass these proposals is that we are going to have a very liberal governor who is going to enact policies that are in direct contrast to what many of us believe in," said Assembly Speaker Robin Vos, R-Rochester. But Democrats said it shows disrespect to the institution. "Republicans couldn't even wait 24 hours after the election to say they were planning to strip Gov.-elect Evers of his powers before he has even taken the oath of office," Assembly Democratic Leader Gordon Hintz, D-Oshkosh, said in a statement released after the session was over. "The disrespect to this institution shown by these actions is unprecedented and appalling. No one should pretend what occurred last night is remotely normal. It is hard to overstate the long-term damage this will have on our democracy. Republicans are making our state a national disgrace by this blatant attempt to override the will of the voters," Hintz said. A number of large health groups in Wisconsin oppose the Medicaid legislation, saying it could have unintended consequences and is more restrictive than the federal waiver. Organizations signing the letter include the Medical College of Wisconsin, insurers and the Wisconsin Medical Society. There's also opposition from groups worried about protections for pre-existing conditions. The American Lung Association said 64,000 people in Wisconsin have lung disease and could potentially be denied health care if a federal lawsuit against the ACA succeeds. If Walker signs the health bills before leaving office, it could thwart campaign promises of the Democratic governor and attorney general. "If you talk about the issue of pre-existing conditions and getting out of the Affordable Care Act lawsuit, both the attorney general, Josh Kaul, and I ran on those issues. We said it 15 times every single day," Ever said in an interview Tuesday evening on CNN before legislators voted to curb the authority of both the incoming governor and attorney general. "Everybody knew that's what we were going to do and clearly that is one of the things they want to stop us from doing," said Evers. Allowing the Legislature the power to intervene in court challenges regarding the constitutionality of the ACA, "in all likelihood it would make it impossible for the state of Wisconsin to withdraw from that lawsuit," Kaul told reporters Tuesday evening.